One of my favourite coding activities is profiling – taking a Java application and making it run faster. Every so often we set aside some time to just focus on making our code run faster. Don’t optimise code where speed does not matter. Not only does it give no benefit, it probably makes that code harder to support and may introduce bugs. Before you can do this, you need to find the bottlenecks – which bits of the code are used most. These are the sections which are worth improving. You can find these using a Profiler. Methods that are frequently called or used often are worth looking at. Other methods are not worth bothering with. If you take a method which takes 2% of the time and make it twice as fast, the code will be a petty 1% faster. If you take a routine used 30% of the time and make it 10% faster (a much easier task) you will get 3 times the benefit. 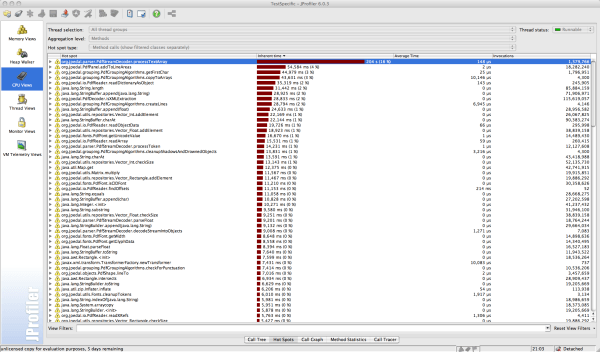 Profiling also tells you where it might be worth caching values. If you can reduce calls to some routines it will make it faster without having to change code. So if you have not tried profiling your code, try NetBeans or the JProfiler demo on some code and be amazed at what is going on. And if you want some more speed in your PDF Viewer, try our new 4.21 release here. This post is part of our “Java Articles Index” series. In these articles, we aim to explore the world of Java and Javafx. Have a look through!